Recipe Making Practical Fu Yung -Fuyunghai cuisine is adapted from one of the chinese cuisine. Where if in Indonesian, egg foo young can be interpreted as an omelet with crab meat. This one recipe included in the menu dishes are very practical and easy to manufacture, and suitable as a side dish when dining with family. Want to know how to make it? 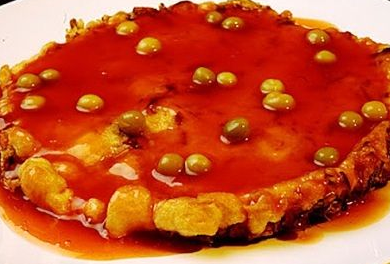 The following is a recipe to make egg foo young we outlined practical for you. The first step, beat eggs, then put all the ingredients Fu Yung Hai. Then stir until evenly distributed. After that, heat the oil and fry the dough Fu Yung Hai until lightly browned on one side, then flip and cook until browned and the inside should certainly have matured. Next, make the sauce: Saute chopped garlic until wilted in hot oil, then enter the tomato sauce along with chili sauce and Worcestershire sauce. Then enter the water and cook until boiling. After that enter along with salt pepper and sugar to taste. Then enter peas which have been previously boiled. Finally enter the cornstarch solution, then stir until thickened and then immediately remove and pour on Fu Yung Hi, After the artificial egg foo young you are ready to serve. 0 Komentar Untuk "Recipe Making Practical Fu Yung"